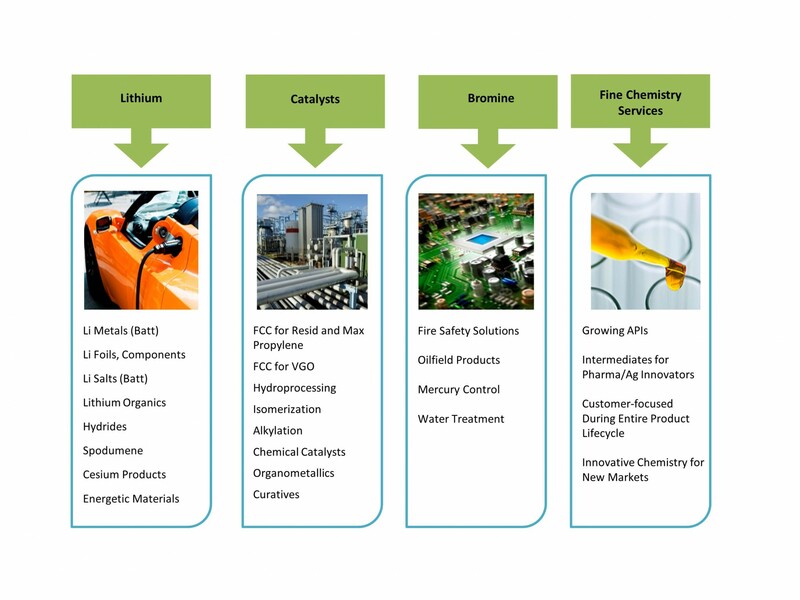 Albemarle is the industry leader in lithium and lithium derivatives, one of the highest growth markets in the specialty chemicals industry. Our unique natural resource position, derivatization capabilities and technology leadership gives us a sustainable competitive advantage. Albemarle's Bromine Specialties business plays a leading role in providing performance solutions for fire safety, oilfield drilling, pharmaceutical manufacturing, high-tech cleaning, water treatment and food safety for a growing world. We provide top-performance catalysts, technologies and related services to the refining and petrochemical industries. We deliver a robust portfolio of catalyst solutions that apply to the entire refinery process. Albemarle's Fine Chemistry Services group has been an industry leader in contract pharmaceutical, agrichemical, lubricant and specialty chemicals manufacturing. Our world-class facilities and advanced R&D capabilities enable us to aid in every stage of product development.